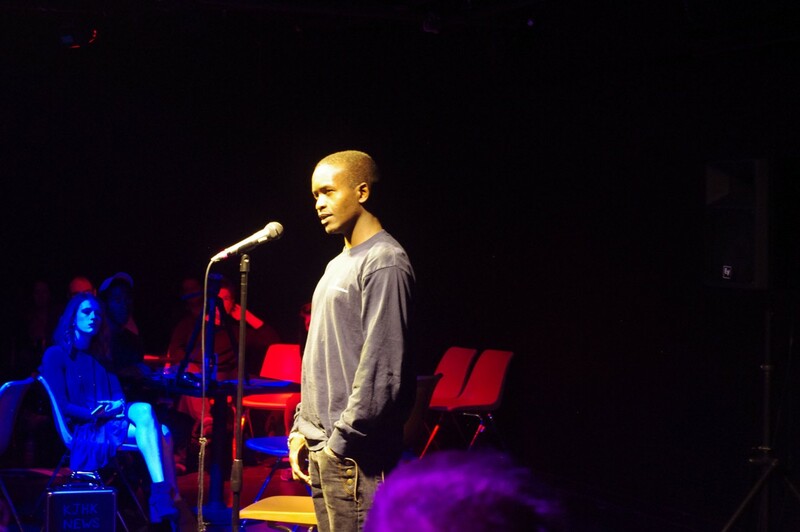 A participant in the project's Storylab workshop shares his migration story publicly at a local Story Slam. Image courtesy of the Kansas African Studies Center at the University of Kansas. 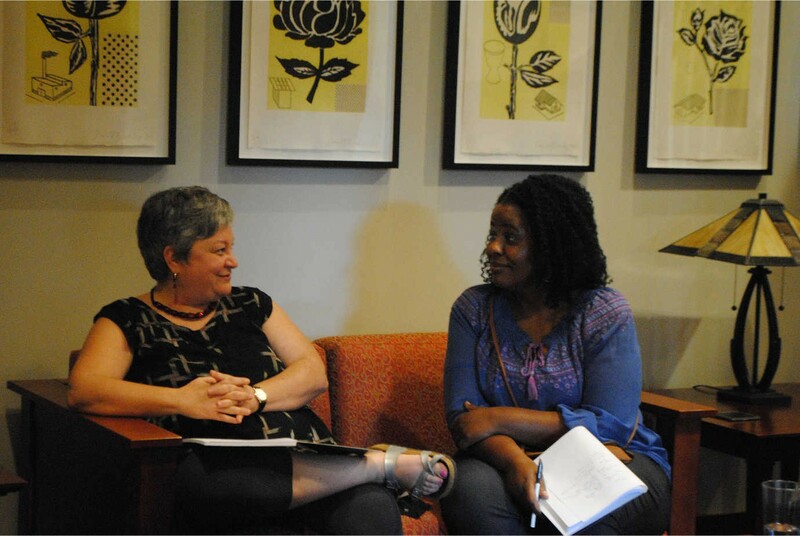 In response to an NEH call for projects that would spark community dialogue, University of Kansas faculty created a program that would engage some of the more vulnerable members of its community: African migrants to the Midwest. Migration Stories helped Kansas communities consider how migration patterns are changing their region and learn more about the migrants in their midst. Over the course of a year, the Migration Stories project hosted film and book discussions; theatre, art, poetry, and storytelling workshops; and engaging lectures. And, in collaboration with the University of Kansas Spencer Research Library, the project documented and preserved African immigrants’ oral histories, many of which can be viewed on the Migration Stories website. 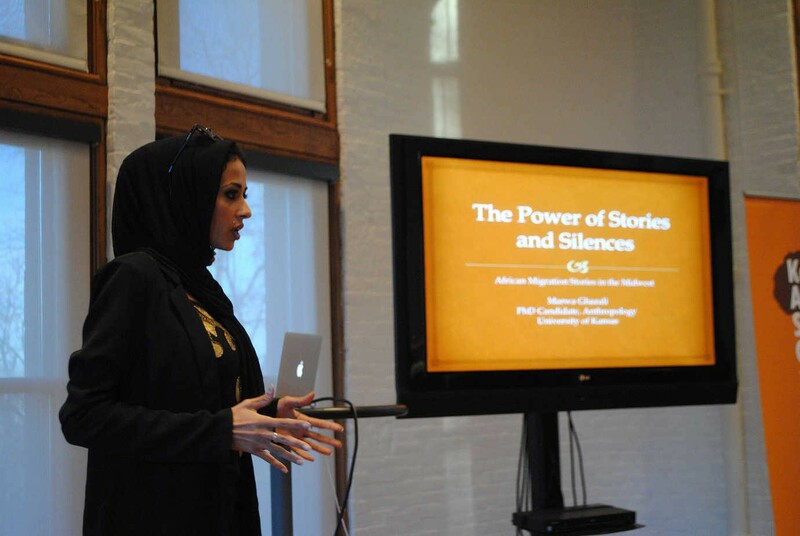 Marwa Ghazali, a staff member on the Migration Stories project, spoke to rural communities across the state through the Kansas Humanities Council's Speakers Bureau. Image courtesy of the Kansas African Studies Center at the University of Kansas. A great deal of the project’s work directly engaged youth by offering storytelling, theater, and visual art workshops to high school students in ESL classes. These included children of African-born parents, as well as others from around the world. The project reached older audiences through a partnership with the Kansas Humanities Council. Through its Speakers Bureau, a staff member on the project spoke to rural communities around the state about her work with the Somali community in Kansas City. Migration Stories and the Kansas Humanities Council also partnered to offer book discussions and screenings of Welcome to Shelbyville, a documentary about immigration in rural Tennessee, throughout the state. The screenings prompted conversations about the struggles and triumphs that occur as communities deal with major demographic shifts. Workshops enabled members of immigrant communities to tell their stories through the memoir, theater, and the visual arts. Image courtesy of the Kansas African Studies Center at the University of Kansas.